The honour roll commemorates former scholars of the school who served in World War One. After the Newcastle Earthquake (1989), the Wickham School was closed and the Honour Roll was transferred to Newcastle Regional Museum. The roll was damaged in the 1989 earthquake but has now been restored. 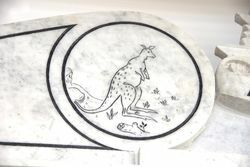 A marble honour roll with a crest comprising an Australian Military Forces badge with supporting Kangaroo and Emu. The years (1914 and 1919) are centred within laurel wreaths. 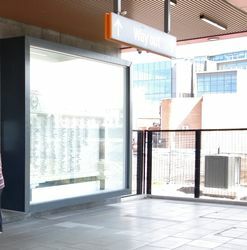 Note : This honour roll was relocated to the newly-completed Newcastle Interchange (formerly Wickham Railway Station), which opened in October 2017 and is on loan from the Newcastle Museum. An honour roll, containing the names of former scholars of the Wickham Superior Publlc School, was yesterday completed by Messrs. Meldrum and Markey, the contractors. The roll is of white Italian marble, and the main tablet, on which the names of the soldiers are inscribed, is of one slab of beautiful polished marble, measuring 11ft x 4ft. There are two grey granite polished columns in the polished bases, and carved Corinthian caps on either side support the pediment of rich moulding and entablature. 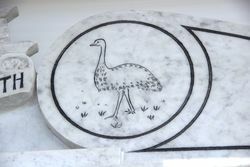 The crest of the Australian Imperial Forces, richly carved on the apex, is supported by scrolls, on which are embossed the Emu and the Kangaroo, a flaming torch, and a set of scales, emblematical of Australia fighting for liberty and justice. The whole structure measures 11ft 6in x 8ft 6in, and it is probably the finest memorial of its kind in the district. The roll has been placed in the main entrance to the boys' school. The unveiling will take place on Saturday. The names inscribed on the roll number 265; the asterisk denoting those who have given their lives for the cause for which the allies are fighting. Unveiled 27th July 1918 by Ald R. J. Bond Esq J. P. Mayor.